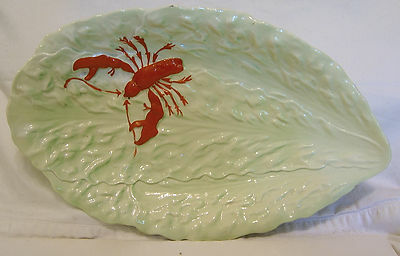 This is one of the later 'Lobster' series of tableware produced by Carlton Ware after the series was changed to Langouste when, at the same time, two new colours - cream and chartreuse (a variation of pale green) were introduced. This is the standard light green colourway. The dish is in excellent condition with no chips/nibbles/etc. It measures approx 11.75 inches (30 cms) in length with a maximum width of 7.25 inches (18.5 cms). It is backstamped appropriately and has an impressed number which is too faint to read!.